Raspberry rhubarb mini bundt cakes with a bright and summery raspberry glaze! This recipe is sponsored by Wilton. As always, all thoughts and opinions are genuine and 100% my own! Ask me what my favorite meal of the day is, the answer will always be: brunch. It’s the best of both worlds: all the sweet breakfast (or even dessert!) options, but with plenty of savory dishes in the mix as well. And since brunch is generally a weekend or holiday activity, it makes for such a good opportunity to relax, indulge, and even to celebrate! Whether it be a birthday, a graduation, a promotion, a marriage, a baby… there’s so many excuses to bring your loved ones together for a special occasion brunch (mimosas, anyone?!). And today I’ve teamed up with Wilton to bring you this raspberry rhubarb mini bundt cake recipe, which would be the perfect addition to your celebratory spread. I’m totally hoping this recipe inspires you to plan a brunch worth celebrating this summer! I loved using Wilton’s 12-Cavity Mini Fluted Cake Pan to make these mini bundts and was pleasantly surprised at how easy it was to remove the bundt cakes after they were done baking. This recipe produces enough batter to make exactly one dozen mini bundt cakes, filling each mold about 2/3 of the way full with batter. I wanted to keep these cakes feeling light, summery, and celebratory, so I decided to go with raspberry and rhubarb. I love the bright, punchy color of the raspberry glaze and the tartness of the raspberry/rhubarb combination perfectly cuts through the sweetness of the cakes. As a final finishing touch, I added white nonpareil sprinkles (I used the ones from the Wilton Everyday Mega Sprinkle Set) to make them extra festive! Rhubarb is a vegetable that happens to look a lot like celery, but (thankfully) tastes a lot different! Here in the Midwest, it’s usually one of the very first items available at the farmer’s market each spring, which is generally where I buy my rhubarb. However, I’ve used plenty of rhubarb from the grocery store as well! At my local store, I typically find the rhubarb in the refrigerated produce section, pre-trimmed and packed in a plastic-covered tray. Since rhubarb season goes so quickly (late April thru June), I always try to grab plenty while I still can! If you anticipate craving rhubarb throughout the year (I always do), you can buy extra and freeze it for later. The rhubarb stalks will usually vary in color from light green, to pink, to bright red. When selecting your stalks, look for ones that are firm and crisp. Avoid stalks that feel rubbery, bend easily, or appear wilted. Most rhubarb will be sold with the leaves already trimmed off, but if they are still attached (or if you’re growing it yourself), just make sure to trim the leaves as they are poisonous! But please don’t let that scare you away from rhubarb – as long as you’re not eating the leaves, you’re good! These mini bundt cakes are best when served the day of. However, if you need to prepare them a day or two in advance, I recommend storing the cooled cakes in an airtight container. Then, add the glaze and sprinkles just before serving. 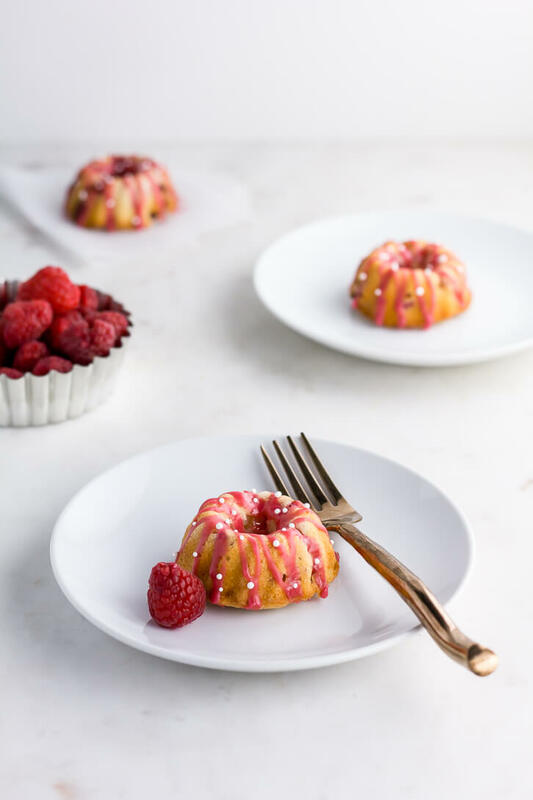 Raspberry rhubarb mini bundt cakes with a bright and summery raspberry glaze! The perfect addition to your celebratory brunch table. Preheat the oven to 350 degrees. Generously grease and flour a 12-cavity mini fluted cake pan (see above). Add rhubarb and 1 tablespoon flour to a medium-size bowl. Using a large rubber spatula, toss to coat. Add the halved raspberries and very gently toss the mixture once more. Avoid breaking up the raspberries as much as you can. In another medium-size bowl, whisk together the remaining 3/4 cups flour, baking powder, and salt. Set aside. In a large bowl, using an electric mixer, cream together the butter and sugar for about 4 minutes until light and fluffy. Reduce speed to low, then add the egg, mixing to incorporate. Scraping down the sides as necessary, add the vanilla extract, Greek yogurt, and lemon zest. Beat on medium speed until everything is combined. With the mixer on low speed, add the dry ingredients in halves, mixing to incorporate after each addition. The batter will be thick. Using a large rubber spatula, very gently fold in the raspberries and rhubarb until just combined. Again, avoid breaking up the raspberries as much as possible. Spoon the batter into the prepared cake pan, filling each mold 2/3 of the way full. Bake at 350 degrees for about 18-22 minutes or until cakes are golden brown on top and a toothpick inserted into the center comes out clean. Let cakes cool in the pan for about 10 minutes, then remove the cakes (use a knife to loosen the edges of each cake if necessary) and transfer the cakes to a cooling rack to cool completely. While the cakes are cooling, combine the lemon juice and raspberries in a small saucepan. Simmer over medium heat, stirring frequently, until the juices are released, the berries are broken down, and the mixture is slightly reduced. You can press down on the berries with the back of a wooden spoon or spatula to help them burst. Place a mesh sieve over a small bowl and press the berries through the sieve to remove all the seeds. Discard the seeds and let the raspberry juice cool slightly. Alternate gradually adding the powdered sugar and 1 teaspoon of milk at a time to the bowl, whisking until the desired consistency is reached. Once cakes are cool, drizzle the glaze over each cake using a spoon or a squeeze bottle. Sprinkle with white nonpareils as desired. Thanks so much, Nicolas! You’re too kind! These could be the cutest little cakes I’ve ever seen! And sound delicious too! Thanks so much Nicole! Berries and rhubarb are just the best combo, aren’t they? Would this recipe work for just one regular size bundt cake? Raspberries and rhubarb, two of my favorite things! Can’t wait to try! Hi Hollie, yes, you could make this in a larger size bundt pan, but you may need more or less batter depending on the size of your pan. Of course, the baking time would need to be extended!